Laura Morgan has worked in the health-care industry for more than 10 years. She began her career as a clinical dietitian and evolved into a sales copywriter for a national health insurance company, generating privately labeled brochures and sell sheets. Morgan holds a Master of Science in dietetics from D’Youville College. Most foods can be included in moderation as part of a healthy diet and steak is no exception. Beef is a nutrients, so it supports tissue function. However, some cuts of beef come packed with saturated fat and cholesterol. Choose lean cuts of steak and practice healthful cooking techniques to limit your saturated fat intake. Steak provides protein your body uses for tissue maintenance, as well as to support your immune system. It also comes packed with iron and vitamin B-12 -- two nutrients you need to make red blood cells, the cells responsible for oxygen transport in your body. Adding steak to your diet also helps you consume more zinc, a mineral important for protein function. Zinc activates enzymes needed for a healthy metabolism, and also helps regulate gene activity in your cells. Too much dietary saturated fat and cholesterol can lead to obesity, high blood cholesterol and heart disease. Obesity itself is a risk factor for many other illnesses, including type 2 diabetes and some cancers. For all these reasons, it’s important to limit your intake of saturated fat to lower your health risks and achieve an optimum level of wellness. When shopping for steaks, choose lean cuts which have the least amount of marbling, or visible fat. Look for certain words on the packaging, such as round or loin, or check with the deli attendant or butcher if you’re not sure. Lean cuts of beef include tenderloin, top loin, sirloin, top round steak, top round roast or eye of the round. How steak is prepared can also affect its saturated fat content. Trim any visible fat from the cut of steak before cooking. 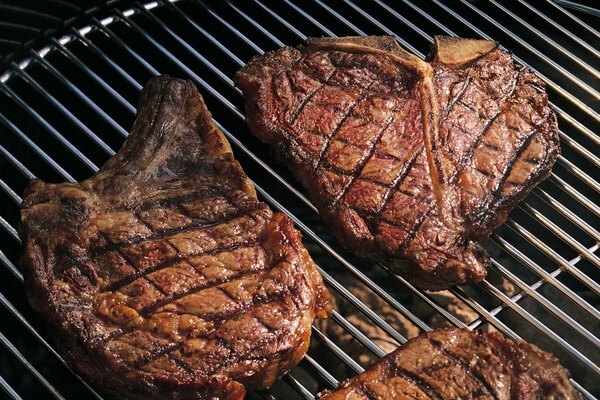 Broiling, grilling or roasting are cooking techniques that allow fat to drip off the steak, rather than settle into it. If you add anything to your steak, such as cooked mushrooms or sauces, be aware of how these are prepared as well. Cook the mushrooms in olive oil rather than butter. Steak sauces can be high in sodium and calories, so read the label for the serving size and enjoy toppings in moderation. The Centers for Disease Control and Prevention advise against exposure to charcoal, including food items that are charcoal-grilled or charred, which may pose a cancer risk. To reduce associated health risks, the United States Department of Agriculture suggests moving grill coals to the side and placing food in the grill’s center. Always remove charred portions before eating. Is Celery & Peanut Butter Healthy?